Brown was born at Calais and studied in Antwerp and Paris before settling in London in 1844. A growing interest in painting subjects in daylight was reinforced by a visit to Italy in 1845-6. Brown was close to the Pre-Raphaelite Brotherhood though never a member of it. 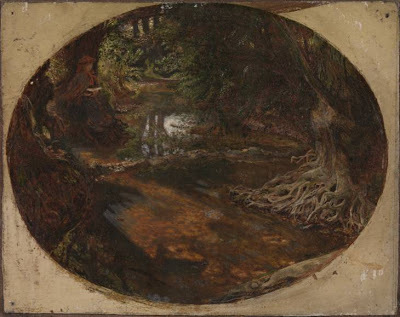 Millais' example inspired him to try his hand at painting small landscapes outdoors. This one and 'Carrying Corn' were worked on at the same time, one in the mornings and the other in the afternoons. The Brent picture, the morning work, took Brown most of September 1854 and was then finished in the studio.